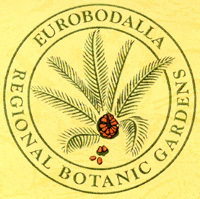 The Eurobodalla Regional Botanic Gardens and associated Herbarium occupy 83 ha of mostly dry forest with some moist creek areas, 5kms from the NSW south coast town of Batemans Bay. The majority of the land is undeveloped but with made tracks and enhancement plantings. Display gardens are situated in the carpark and around the visitors' centre, picnic area and arboretum. The Gardens only display regional plant species. Erect small tree, phyllodes silver grey, flowers golden yellow. Natural occurrence restricted to limestone ridges and slopes from Bendethera to Bega, Southcoast. The Gardens hold living and Herbarium specimens of this species. Spreading prostrate shrub. Natural occurrene restricted to high altitudes on Southern tablelands. The Gardens hold living and Herbarium specimens of this species. Shrub to 1.5m high. Natural occurrence restricted to south coast from Clyde River to Bega. The Gardens hold living and Herbarium specimens of this species. Shrub to 2m. Natural occurrence restricted to rhyolite outcrops on southern tablelands in Deva NP and headwaters of Tuross River. The Gardens hold living and Herbarium specimens of this species.